But now I’m back walking miles out on the exposed shore, next stop France, making childhood memories with my own children. Despite considering myself a zoologist (of sorts) I was all at sea with this task of identification. Here were creatures (some probably aren’t strictly even creatures ) with a bewildering variety of body plans and phylogenetic weirdness, in contrast to the rather conventional stuff that I’m used to (ie vertebrates, namely birds). We caught all the usual stuff: prawns, crabs, and fish of all kinds: baby pollack, gobies and little tiny flatfish, invisible against the sand, but which flapped tickling around our feet as we walked through the shallows. 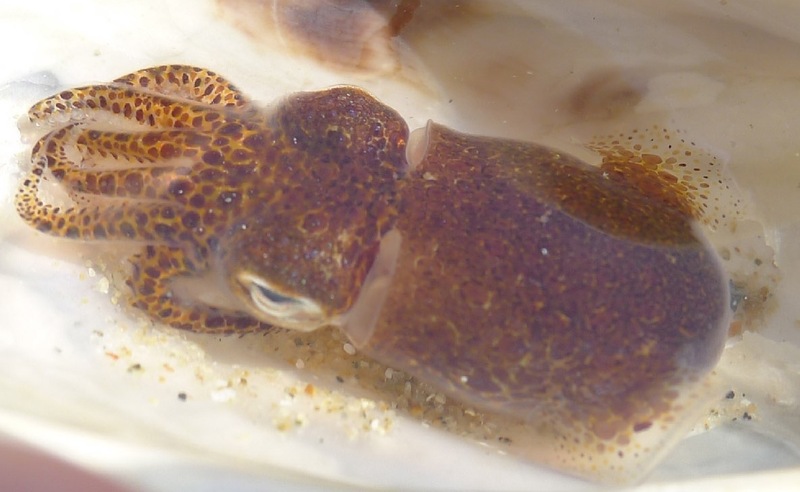 But my favorite was a darling cuttlefish in miniature (Sepiola atlantica) caught by my daughter in a limpet shell. There it sat with enormous eyes and sporting a lovely leopard print design which rapidly changed to a deep purple when rudely prodded by its captor. When we put it back in the sandy pool it shoogled itself down into the sand and left nothing but a pair of eyes showing. We also caught a straight-nosed pipefish (Nerophis ophidion) – that cross between a sea-horse and a bootlace, hanging out among the long brown strands of Chorda filum seaweed. A brown blob covered with exquisitely beautiful yellow stars caused some consternation during my battle with the field guides and I have, at last, identified it as an Star Ascidian (Botryllus schlosseri), a colony of tiny sea-squirts. Improbably the larvae of this colonial blob, which resemble little tadpoles, are thought to be what gave rise to the very first vertebrates. I unfortunately couldn’t take a photo of this distant relative for the family album as it was lost in the excitement of clearing a bucket for the cuttlefish. And an orange spongy thing with a structure a bit like a brain, or a tightly wrapped intestine, remains completely unidentified as it, too, was lost in the scramble to contain the cuttlefish. The weirdest was a blob of transparent jelly, roughly cylindrical and attached to the sand with a kind of stalk. It appeared to have absolutely no internal structure at all so I ruled out the usual IDs the Internet offers for blobs of jelly on a beach – comb jellies, jellyfish or sea squirts. However I did read a passing reference in a website about bait digging, that there is a ragworm which catches its prey using a transparent jelly-like net….. I wonder. All this is grist to the mill of my recent ponderings about people’s connection with the natural world around them. I have been asking myself whether the ability to name a species (or in this case find out their names with a great deal of effort), adds to the pleasure of experiencing nature. Do people who can name the trees they pass on the way to work, or the weeds growing from a wall, or the birds they hear in the morning gain more pleasure than those who pass them in blissful ignorance. If you don’t know the name of something are you less likely to even notice it is there? I am wondering whether knowledge of the unconventional domestic arrangements of the dunnock, or that swift chicks go into torpor as their parents search for food for up to three days at a time adds to the experience of seeing another brown bird in the big city. I certainly believe that it adds a huge richness to my own experience of my immediate environment, whether in the city or at the seaside. While I was scurrying about at low water looking under fronds of seaweed, my colleagues have been doing a bioblitz at a brand new reserve purchased as an extension to RSPB Inch marshes. Scores of them, with partners from BugLife and other NGOs were finding as many species as they could on the site from mushrooms to mites and from mammals to moths. This is both serious conservation, and training for staff, but it is also pleasure. As Bob Dylan sang, quoting from its origin in Genesis, ‘man gave names to all the animals‘. It seems to me that humans really do have a drive to name the living things we share our planet with. And that, by knowing their names, and something about them, we increase our pleasure in our everyday encounters with nature and find a connection with it. And if we start to notice more of nature around us, and take pleasure in it, won’t it be that little bit harder for it to be lost? Postscript: if anyone out there knows what the orange spongy thing was, or the cylindrical jelly blob, please do put me out of my misery. I’m sorry to say that I don’t really know what this is. Could it be a rock goby? 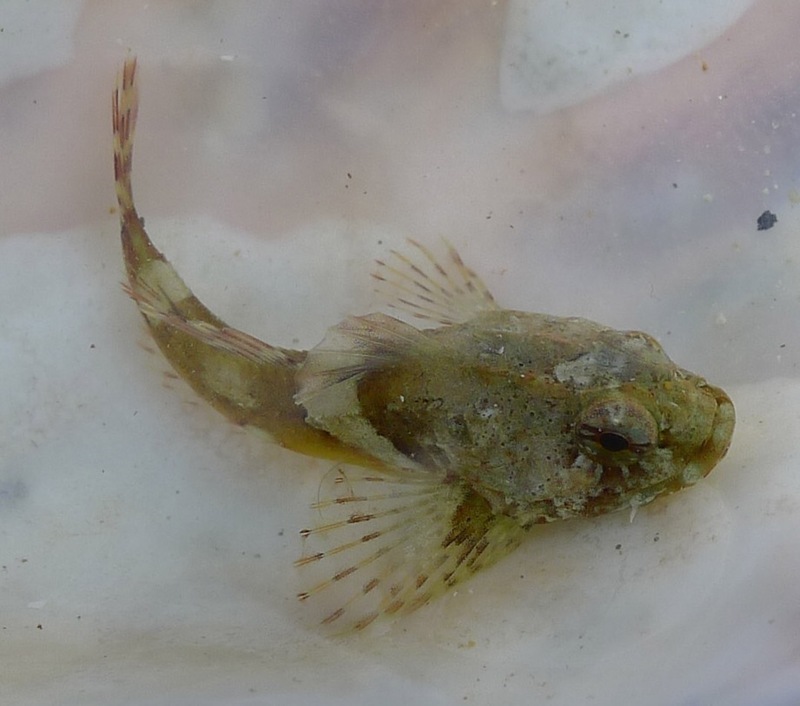 This entry was posted in Miscellaneous, Work and tagged Bioblitz, English Channel, ID, Jersey, low-water fishing, Seashore, species, wildlife by nager. Bookmark the permalink.